No matter how careful and prepared a senior may think they are for a medical emergency by having their health care wishes laid out, that information may not be readily available depending on where the emergency occurs. Senior caregivers can help their senior clients load their information into the My Health Care Wishes app to have handy on their smartphone in event of an emergency. By creating a space for the advance directive documents to live on a smartphone, senior clients medical information is always with them. It also establishes a senior's primary and secondary proxy so there's no room for confusion in time of emergency. The PDF version of a user's health care wishes can be quickly pulled up on the screen, or sent via text or e-mail to a health care professional or family member instead of sitting in the senior's place of residence. If a senior fell and needed to go to the hospital, the medical personnel could look at the app on their smartphone to call the senior's designated emergency contact. 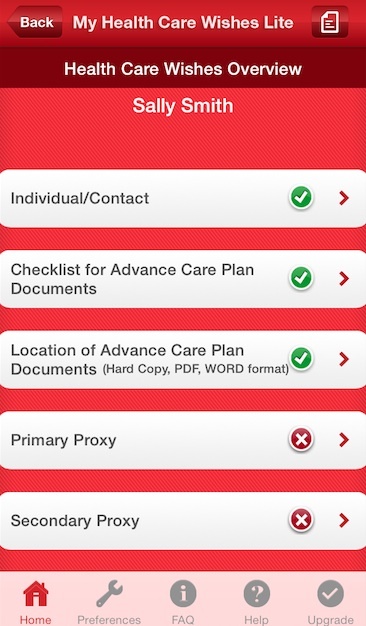 The lite version of the app allows information on the user's primary care physician as well. The layout of the app makes set up and navigation easy so that seniors, caregivers and their families are prepared. Recommended Advance Care Plan Documents for storage in the app include as Advance Medical Directive/Living Will and/or Proxy, a DNR Order signed by physician, a Physician Orders for Life-Sustaining Treatment signed by a physician and an Anatomical Gift decision. This app is available for free for Apple and Android platforms.